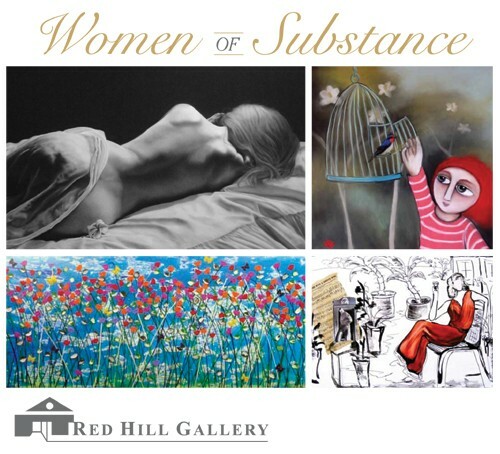 Women of Substance exhibiting February at Red Hill Gallery - featuring Emma Middleton, Rebecca Pierce, Danielle McManus & Madeleine Ekeblad. Emma Middleton Soft, sensual and imbued with beauty! Middleton’s background in dance has given her an innate ability to capture the expressive and often sensuous qualities of both the female form and exquisite flora. Honing in on subtleties such as the curvature of the female form or petal of a flower appeals to the viewers senses, evoke a sense of peacefulness in beauty. Rebecca Pierce Thick, colourful and lively. Pierce’s painting are bold and bright, often depicting flowers in landscapes, the paintings have a definitive separation between foreground and background highlighting the vibrant bursts of energetic paint. Danielle McManus Drawing inspiration from everyday life, McManus’s artworks evoke a story that everyone can relate to. Her whimsically wide-eyed and naive figures are brilliantly thought provoking; situated amongst landscapes with vacant expanses of sky it is the subtle details, such as the inclusion of a letter of Australian Flora and Fauna that bring the paintings to life. Madeleine Ekeblad Intertwines rhythm and music in landscapes. Female figures in beautiful gowns, landscapes and musical instruments are reoccurring themes in her work. Using dramatic colours of mostly black, white and red her use of line emphatically tells a story on the canvas.